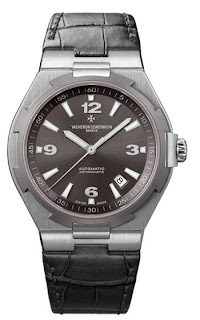 Vacheron Constantin will be launching 2 watches under its Monochromatic Theme. The 2 automatic watches, a three-hand watch and the other a chronograph will be rendered in multi-shades of slate (grey). The Automatic will house the Vacheron Constantin caliber 1226, a 36 jewels movt. beating at 28,800 A/h and the Automatic Chronograph will house the caliber 1137, a 37 jewel 21,600 A/h movt. 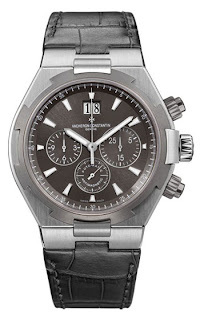 Both watches will spot a 42 mm steel case with titanium bezel, a slate grey dial and white gold hands and hour indexes. The watches will have a water resistant rating of 15 ATM and engraved on the case back will be the motif of the three-masted ship, the Amerigo Vespucci. The watches will come with a 'mouse grey' alligator strap and a black rubber band.